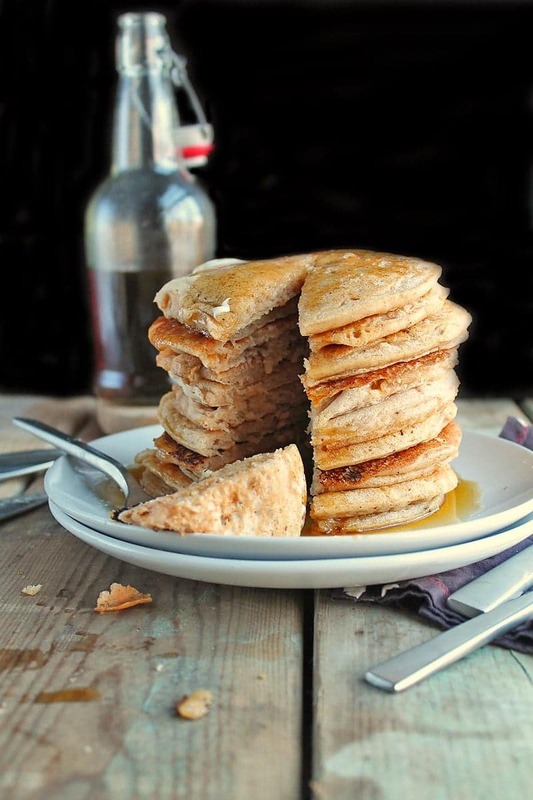 Wake up on Christmas morning to these vegan eggnog pancakes with rum maple syrup for a festive twist on this classic breakfast. Made in just 35 minutes. Preheat skillet or pancake griddle over medium heat. Whisk flour, baking powder, salt, and spices in a large bowl. In a separate bowl combine vegan nog, coconut oil, Buttered Rum Maple Syrup, and vanilla extract. Add to the dry ingredients and stir together. Pour about 1/4 cup of batter onto the hot skilled or griddle and cook 3-4 minutes until bubbles start to appear on the surface. Flip and cook for another 2 minutes. Serve immediately with Buttered Rum Maple Syrup. Heat maple syrup and butter in small sauce pan until butter has melted. Remove from heat and whisk in rum. Let cool.